I'm refitting my Trek 820 with newer components- pretty much everything but the wheels and shifters (which are pretty new). 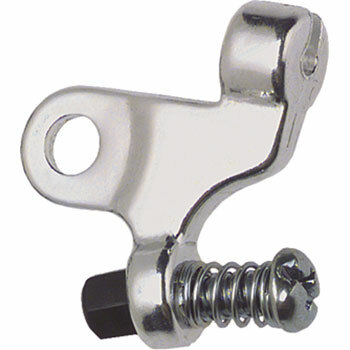 I just got a set of Avid SD 20s and 2.0L levers off of eBay, and I look forward to mounting them (when the levers arrive), but my problem is that as the frame was designed for cantilever brakes, there's no rear cable stop- and it's my understanding that you need one to properly mount linear pulls (if you were wondering, the frame has the tubular pass through thing brazed to the seatpost). Now, I bought a braze-on cable guide from my LBS ($1- can't go wrong), but the problem is that I don't have anywhere to go to that would braze it on for me. No bike shop around here has that kind of equipment, and the closest garage is afraid of melting a hole in my frame. So brazing/welding it on is out of the question. Would the cable guide tear off the frame if i epoxied it on? Is there any other way besides for brazing/welding it onto the frame? My next option would be to use my pretty new Shimano Alivio cantilevers and mount them in the back (they're mounted up front now). They wouldn't match the front brake, but I don't mind as long as they would work with the Avid SD 2.0L levers- am I correct in assuming that the speed dial on these levers can be adjusted so that they can be used with cantilevers? Thanks to all who can help/have input! You could run full length cables and you would then not need the cable stops. The noodle then effectively acts as the stop. If you do this you also get the added benefit of longer life from your cables. I could, but that's ugly and unelegant, especially as the full length housing would need a zip tie to keep it on the frame- I'm trying to make this refit elegant. Thanks for the suggestion though- that was the only other alternative my LBS could offer, too. Well, how about running the housing from the rear noodle on the vee brake, through the loop your old housing used at the seatpost, but stopping at the first cable stop, ie where the canti housing stopped? The loop you ran through will keep things sano looking and out of the way. Just use nice quality housing, like Avid Flak, so it's not too stiff and throws your brake out of adjustment. If you have a place to stop the housing for the cantis, use the same one for that section of housing going to your vees. I've been looking at one of these for similar reasons. Perhaps if you install it upside down you could get it inline with how the cable exits the bikes seattube guide. I did this years ago when V-brakes first came out. It is a cable stop that is clamped around the top tube. It is not cheap, but will give you the clean installation that you are looking for.